"Adventure is not dead. I know adventure is not dead because I have had along and intimate correspondence with adventure." - Jack London, The Cruise of the Snark, when reading hundreds of applications for crew on his 45' yacht prior to his 1907 round-the-world voyage. It's been more than a couple of years since I've been aboard one of the superb Ponant vessels, so the opportunity to examine Le Soleal, the third in the fleet of four ultra-modern and compact cruise ships was quickly jumped at. That, and a chance to make personal maiden calls to the east coast of South America, made the whole package irresistible. From my earlier polar experiences aboard older sisters, Le Boreal and L'Austral, I had already developed a distinct affection for the 142m, 10,000 ton vessels which package chic design and technological prowess with adventurous itineraries that leave few parts of the world unexplored. Launched in 2014, Le Soleal follows closely the layouts of the senior pair with 132 twin cabins. Newest Le Lyrial differs slightly, offering larger deluxe cabins on Deck 6 with a reduced total of 122. As we departed the seldom visited (at least for Australians) port of Montevideo in Uruguay, it wasn't long before we encountered 3m-4m swells and 30 knot winds sailing north toward our next port of Rio de Janeiro. Le Soleal's extra length, compared to similar vessels in this class, soothed the oceans somewhat although it was interesting see Deck 6 awash as the mighty waves broke over the bow. Two sea days gives plenty of time to explore this intimate vessel. I'm in the company of 140 mainly French guests, joined by a smattering of other nationalities including two Australian couples. 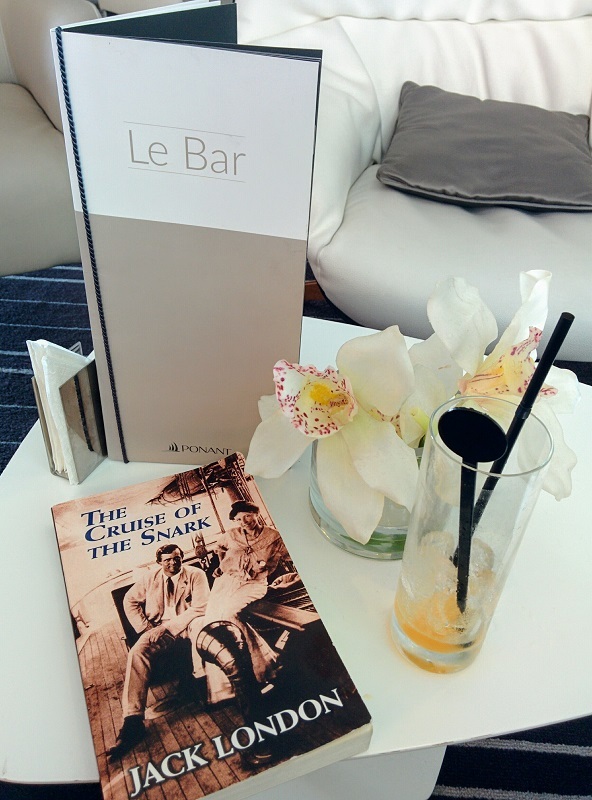 My companion on this trip is the 30-year-old Jack London and his 1911 book: "The Cruise of the Snark". I've been trying to read this for several months and will now get the chance. I'll sprinkle in some pertinent quotes as the journey progresses. Jack London and I at the bar. 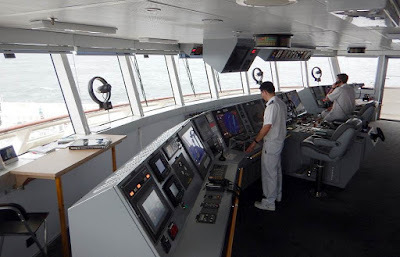 Crew on the bridge of Le Soleal ponder the weather ahead.